With the case constructed and the face frame attached, it was time to turn my attention to the door. The rails and stiles for the door were cut to size at the same time as the face frame. 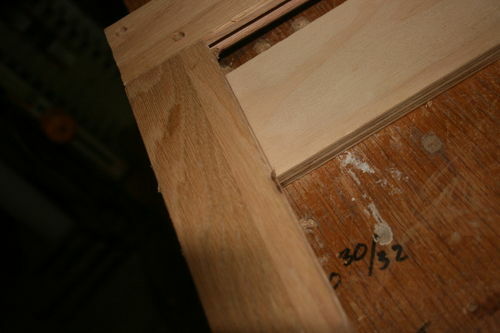 The door frame is joined using through mortise and tenons that are pinned with wooden dowels. Up to this point I have tried to follow Norm’s techniques as closely as possible, but I had to deviate slightly for the first few cuts here. 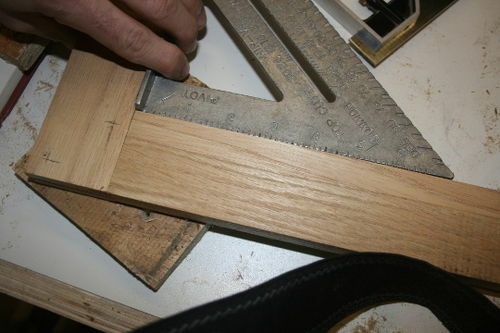 In the book, norm recommends starting with cutting the mortises out of the ends of the stiles. To do this he sets up the tablesaw with a standard blade, raised 1.5” above the table, and positions the fence 1/4’’ away from the blade. Then he runs the stile along the fence, on end, to make one cut, and then repeats the cut on the opposite face. I’m sure it works perfectly fine, and it’s probably safe 90% of the time, but it scares the hell out of me. So, I used my ShopFox Tenoning Jig to make the cuts instead. I think the end result was pretty much the same, I ended up with a slot, and all 10 fingers still attached. I repeated the process on both ends of both stiles. Next up I needed to mill the slots that would accept the mirror. Although I had deviated and used my tenoning jig, I decided to go back to following the instructions in the book. This is where things started going wrong. The book had me change to my dado blade, and set it to make a 1/4” wide cut, with the blade 1/2” above the table, and the fence 1/4” away from the blade. The idea here is that this setup will center the blade in the stock, giving you a 1/4” groove down the middle. I’m not sure if it was because it was getting late, I was getting excited, or I was trying to follow the directions too closely without critically thinking about it, but I broke one of the rules I learned earlier in the project, and didn’t bother to make a test cut in scrap stock first. I ran the first stile through the saw, set it aside, ran the next stile through the saw, and noticed that my “centered” groove didn’t line up with my “centered” mortise(s) that I cut using my tenoning jig. 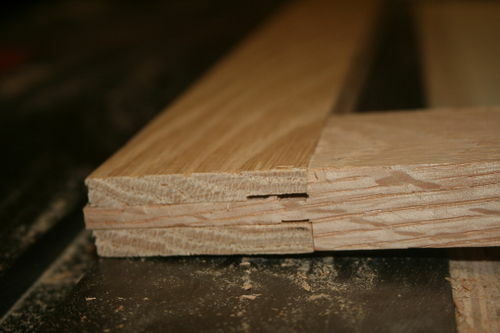 As far as I could tell, my two cuts with the 1/8”(ish) blade for the mortises didn’t result in a full 1/4” slot. I had about 1/16” worth of material on the inside of each. I decided to go ahead and cut the slots on the rails with the dado head still installed, and then figure out how to deal with the extra material afterward. Not the end of the world, just an opportunity to get a little creative….at least that’s what I thought. As I stood at the tablesaw contemplating my next steps, I decided that I would make up for the extra material on the tenons…I could take slightly more material off of one cheek (the one facing the extra material) and everything would be corrected. Sounded simple enough in my head. 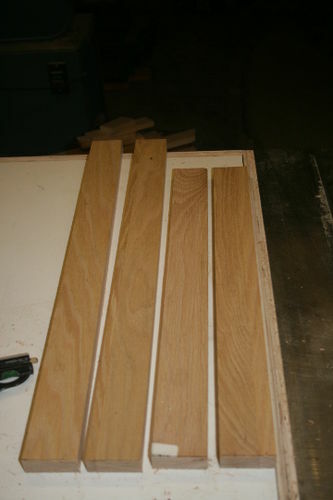 For cutting the tenons I decided to stick to the method described in the book. It wasn’t as scary as the first cut, and I’d already ended up in trouble by doing things “my way” once. 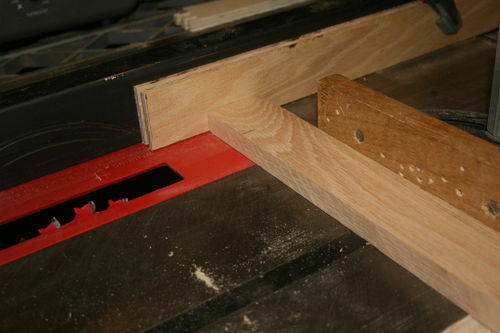 To cut the tenons Norm suggested clamping one of the stiles to the fence to act as a spacer or stop block to get consistent cuts on the shoulders on all of the tenons. 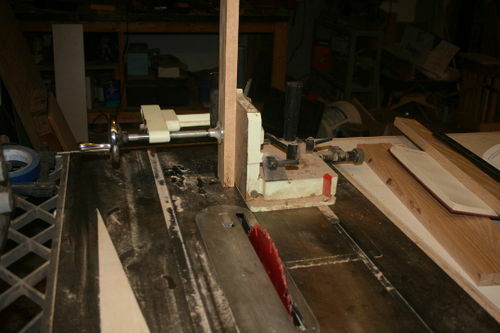 The blade was set to 1/4” above the table, still at 1/4” cut. I suppose I could have added all of the other pieces to the dado stack to get the maximum width of cut, but I decided to leave it as it was and just nibble away the rest of the material. Even with the dado at maximum, it still wouldn’t have been quite wide enough, so I decided not to mess with it. This worked pretty well, make a cut using the spacer to set the distance, flip the rail over, space it out and make the same cut. 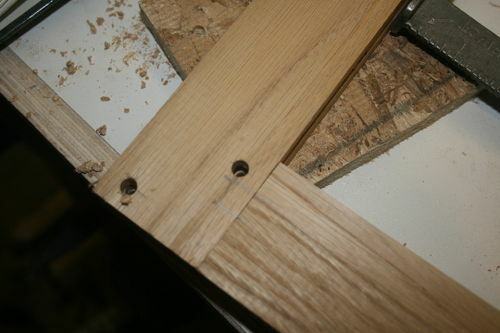 Then it was just a matter of nibbling away at all of the remaining material until I had a tenon. 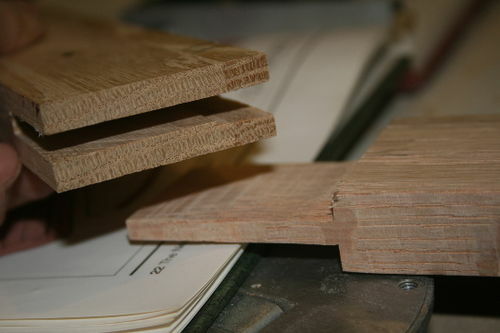 In the picture you can see the extra material in the mortise. Because of the extra material, the next step was to nibble away enough material from one cheek in order to get everything to fit nice and tight. Easier said than done. I set up the cut using the same method of the spacer and nibbling away material. Raising the blade a little at a time, I’d cut, test fit, and cut some more. This worked relatively well at first. Somewhere along the way pieces must have ended up mixed up (should have marked them) and one rail ended up with both tenons cut too thin. Again, not the end of the world, but frustrating none the less. This is the set that fit tight, the other set I didn’t photograph, but it had about 1/32” worth of between the cheeks and the mortise walls. I ended up shimming it with thinly sliced pieces of oak from one of the cutoffs, ended up working out ok, not terribly noticeable, but I know it’s there. With all of the joinery cut and the grooves milled, it was time to drill out the holes for the wooden dowels that would help hold the joinery together. This was fairly straight forward and uneventful. First had to get everything lined up and squared up. Then I used my combo square to measure and mark the location of each hole so that they were all in the same spot all the way around. Then I used a 1/4” brad point bit to drill all the way through. The holes drilled out the next step was to break all of the edges. Following the instructions in the book, I used a 1/4” round over bit in the router. I’m not exactly sure how this was supposed to work, since the guide bushing would essentially drop into the groove I cut for the mirror, but I thought I’d give it a shot anyway. It didn’t work out so well. For the most part it went alright, but there were a few spots where the bit gouged the wood and ate out more than I intended. You can see it in the picture above. If the sloppy fitting mortise and tenon irritated me, this pissed me off. It was late and I was getting tired so I decided to finish the assembly and sleep on how to proceed next. I brushed glue onto the cheeks of one of the rails, assembled, and then smeared a little glue on the 1/4” dowels that would hold it together and assembled it, leaving it to dry over night. As I write this I’m still not sure how I want to proceed. Part of me thinks I can hand sand the router gouges out, at least make them less noticeable. And another part of me (the perfectionist) wants to remake the entire door to get the joinery more precise and the round over a little cleaner. I have the lumber, but am not really crazy about the idea of using it. With all of that being said, I am definitely glad that I decided to do the project and feel like I am learning a lot of things in the process. Both from the book and through trial and error. I plan to finish the build tomorrow (Saturday), but still have a a little ways to go. I still need to route out the rabbet in the back to accept the 1/4” backer panel, mortise the piano hinge into the door and cabinet frame (a first for me), and attach the top shelf to the top of the cabinet case. I also have to make a decision about finishing the project. The finishing chapter isn’t until the very end of the book, so if I choose to go chronologically, I may end up with a shop full of unfinished projects (not the end of the world). As a preview, Chapter 2 is all about building a low cost workbench, which I am VERY excited about. If anyone knows where I can pick up a decently priced bench screw, I’d appreciate the input. I don’t want to spend a ton on one, but want to get something that works well. I need to do a little more exploring but it looks/sounds like what I need, and the price is definitely right. Anyone reading this forsee any issues with using it? I’ve also seen people on the internet recommend getting a long piece of all thread and making a bench screw…but I think I read somewhere that the number of threads (sorry if this is the wrong terminology) is wrong and will make it take FOREVER to actually clamp it down. I will keep exploring and address the issue in the first Workbench blog where I detail all the materials necessary. I’d like to include any thoughts people have on the issue in the blog – this place is FULL of very knowledgeable people – which I love. A long piece of all thread will be really slow. A length of ACME thread would be better (Fastenal is my source for ACME threaded rod). Thanks gfadvm, I appreciate the input.